Humax STA-1200BSW review | What Hi-Fi? The “world’s slimmest soundbar” – that’s the raison d'être of the Humax STA-12000BSW. Measuring just 2cm deep, it’s as thin as a Mars bar (we checked). 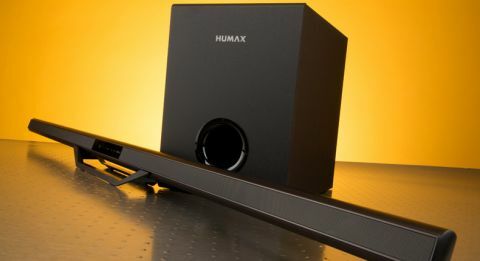 Humax is best known for its set-top boxes and PVRs, so it deserve kudos for entering the crowded budget-soundbar market, and with something that will certainly raise eyebrows. We’re quite taken with the Korean company’s nickname for the bar, too: ‘The Blade’. The STA-12000BSW is less than 4cm tall, too, so it’s safe to say it will sit in front of your telly without blocking any part of the screen. Its broad 120cm-frame makes up for its slenderness elsewhere – so to put it in perspective, it spreads approximately the width of an average 55in telly. It’s hard to believe there’s any room inside the STA-12000BSW for any internal workings, but the thin grey strip that runs across the matte-black body hides four drivers underneath. As you’d expect, a separate subwoofer boosts its efforts. The space-efficient sub is easy to house, too. While most soundbars come toting a wireless sub, the Humax’s passive woofer needs to be wired to the bar (on the plus side, it doesn’t require power from the mains). The 3m-long cable shouldn’t be an obstacle to positioning though, as the sub should be placed near the bar for best integration, anyway. Unsurprisingly, Humax has had to make some compromises for the soundbar’s skimpy build, one of which is its dependence on a small, plastic stand to sit upright. It raises the STA-12000BSW a few centimetres off ground level, although it's still not obstructive. The fact that it has to be placed centrally on the stand makes it a bit of a balancing act though, and it can topple from a faint knock; applying pressure to the touch controls caused it to wobble slightly. Stay away from the STA-12000BSW and use its remote, even if it is one of the worst offenders for appalling soundbar controllers. Prone to scratches and finger marks, its glossy-black body looks and feels cheap. Connections suffer slightly, too. The choice of only optical and 3.5mm inputs will suit most set-ups, although the inward-facing sockets are a little hard to access and have very little room around them. Owners of chunky cables (or ones with large plugs), beware! Of course, extreme slimness isn’t everything – how does it sound? A skinny build on a soundbar often means thinness and imbalance, and you’d be forgiven for thinking this will be the case here – but the STA-1200BSW’s balance is largely fine. Put on motorbike racing documentary TT3D: Closer to the Edge and it does well to avoid making screeching brakes sound brittle and hard. The sub delivers a tight, controlled bass, while interviews with legendary bikers come through with reasonable clarity and substance. The unit's physical proportions help its case for a relatively wide soundfield: bikes tear across the screen. Its delivery is significantly more full-bodied than through most TV speakers – turning on its ‘Bass’ mode brings a trace more weight, still. That said, as motorbikes move up the rev counter, they don’t exactly roar through the STA-1200BSW. The price-matching Polk N1 is much more of a powerhouse, and strong-arms the Humax with more muscle and hardihood. Detail is good enough to find the sound of changing gears underneath the dominating whir of the bike, but there’s room for improvement: Jared Leto’s narrating voice is largely swept aside. The Humax’s lack of dynamics is its undoing. They resemble a punctured tyre – flat and undesirable – as the riders cane it around the dangerous racetrack. The boisterous blend of crowd-noise and raucous engines are bookended within a fairly limited dynamic scope. Its volume ceiling isn’t quite cut out for those looking for a blockbuster-movie experience, although it is more than adequate for general TV viewing or music listening in a medium-size living room. We spin Happy by Pharrell Williams and the STA-1200BSW’s delivery is certainly listenable. Its presentation is spacious enough to give the piece a sense of staging, even if it does fail to get us foot-tapping as we usually do with this tune. Unfortunately, the Humax STA-1200BSW’s USP starts and ends with a super-thin frame. Its performance cannot be dismissed – it’s balanced and an improvement from the sound of most TVs – but it falls short of the detail and dynamics of the competition out there. When it comes to soundbars, size matters - but sound matters more. We’d take our money elsewhere.